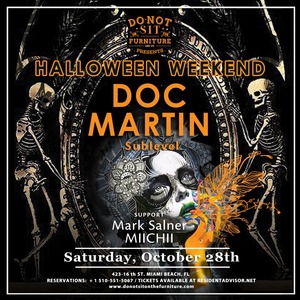 Our Do Not Sit On Halloween weekend continues on Saturday, Oct 28th with non other than West Coast legend Doc Martin! Doc Martin (Sublevel) soundcloud.com/sublevel-music facebook.com/Doc.Martin.Sublevel Support: Mark Salner MIICHII >>>>>>>>>>>>DOC MARTIN<<<<<<<<<<<<<<<<<< Doc Martin (Sublevel) is the head of Sublevel Recordings and a pillar of the west coast underground. With years of experience behind the decks, he's held residencies at some of dance music's most storied venues including New York's famed Twilo and LA's Metropolitan. A true DJ's DJ in every sense!